A small rear extension to a large period property unlocked the lower ground floor to allow a front to back kitchen and family space with a strong connection to the garden. It is a harmonious balance between traditional detailing and contemporary aspiration. The space is bright and functional, connects to the garden and provides everything that modern family life requires. The styling is both sympathetic to the period of the original building and also to the aspiration of the client. 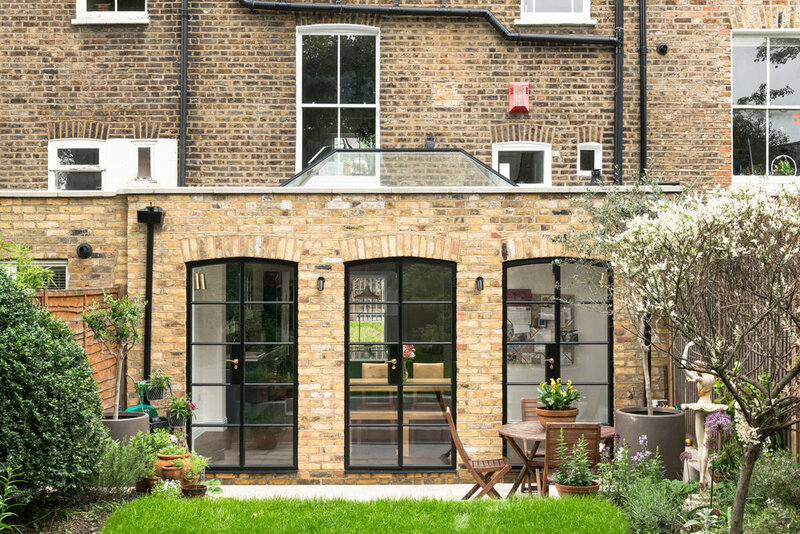 The project has highly crafted traditional constructions with structural brick arches, and curved tops to the steel framed french doors, a lantern roof light and a framed timber kitchen. To compliment this the finishes and colour pallet to the space are crisp and modern.